Going to work is a part of life. It is necessary for you to earn money in order to make a living to pay the bills and enjoy the luxuries life has to offer. 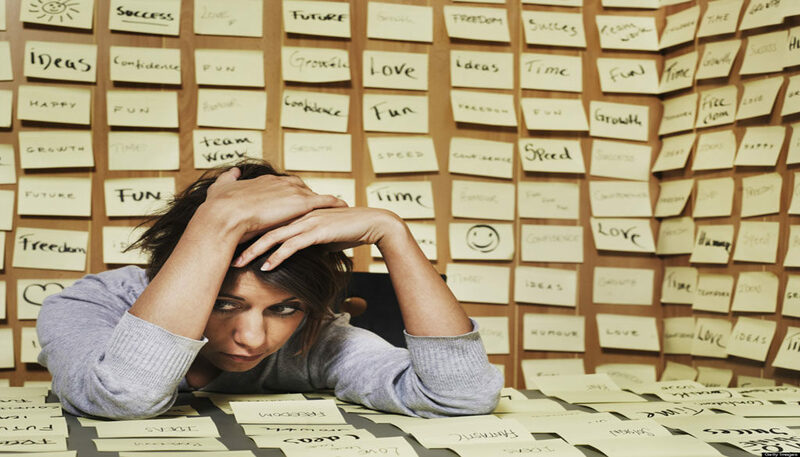 Learning how to handle feeling overwhelmed at work has been a challenge for many people over the years. You may feel like you are doing the work of two people and only getting paid for one. Know that since you spend more than half your life at work it would a good idea to know how to eliminate the feeling of overwhelm when you are there. Work can be a source of stress for many. Perhaps the nature of your job is naturally stressful. Your workload may be enormous and deadlines come up way too quickly. Perhaps you have coworkers that aren’t carrying their load, or some interesting character that are challenging to work with. Maybe you feel your boss sets you up for failure with unrealistic expectations and you feel unappreciative for all the hard work you do. Although these stresses can cause you to feel overwhelmed at work, there are ways to cope and manage your feelings. Once you realize that you are beginning to feel overwhelmed, take a step back from whatever you are doing and take a deep breath. Repeat this process 5-10 times. Focus in the moment only on taking slow, deep breaths in and out. This will help bring you back to the present instead of perseverating on what’s to come, as well as feel more relaxed. Feeling overwhelmed at work can bring other negative feelings up, such as anxiety, fear, frustration, uncertainty, and maybe even depression. Counting breaths when we notice we are becoming overwhelmed will help clear your mind and calm your nerves immediately. Typically, overwhelming feelings are a result of our mind. You may overthink when one thing comes up, and then start to bring up of all the other things you have to do. Eventually, they all add up and you begin to think about how difficult it will be to complete all these tasks on time. It doesn’t stop there; it begins to compound as you start thinking about what might happen if they aren’t completed. It becomes a vicious cycle. I like to call it a crazy eight. You begin to run loops around yourself feeling good and then spiraling down, over and over again. Before you let your thoughts get away from you and begin to imagine the worst-case scenarios, which will make you feel even more overwhelmed, slow down. Allow them to come up, thank them for being there and then give them permission to leave so you can move on. When it comes to dealing with others who may stress you out, it helps to be more understanding. If you experience being called out at work negatively, whether it is from a coworker or your boss, think about why they’re acting that way, instead of thinking that they’re right about what they said. Maybe they weren’t in a good mood, perhaps they’re Hungry, Angry, Lonely or Tired and they need to H.A.L.T. but don’t know how. Maybe their personal life isn’t going well and they are not coping with it effectively and taking it out on you hence they may be feeling overwhelmed at work too. Changing your frame of reference can help you manage your feelings of overwhelm and stress, as it comes from how you see the world and respecting others may not see it the same way. See things more positively and optimistically and notice how easy things will become around you. Be mindful and observant when looking at what is going on in the workplace. If you feel attacked at work by a coworker or your boss, remember people actions are a direct reflection of their personal feelings of themselves. The way people behave to you has absolutely nothing to do with you, but shows everything about them. Know that there is nothing wrong with you. They may feel that their needs aren’t being met and putting their fears on you. 5. Do one task at a time. It has been proven that multitasking effectively is a myth. Studies have shown that people are more productive when they do one task at time. Become more organized, if you aren’t already. Create a list of things you need to do, and prioritize them with the most urgent and important tasks first. This will help you visualize how you are going to get things done, which will help give you a sense of structure and vision for accomplishment. 6. Focus on yourself by doing your best. Continue to work smart at work. Complete your tasks accordingly and continue to meet deadlines and requirements on time. When you know you are doing your best and focusing on your work, false comments from yourself and others will have less of an effect on you. You will be too focused on the task at hand opposed to listening to negative remarks that are unproductive. 7. Express yourself and your concerns. If you’ve tried these breathing techniques, thought about your peers from a different perspective, organized your workload, and continued to be productive, yet you are still feeling overwhelmed, there are a couple of things you can do. You can directly let your coworkers and boss know how you feel. If the workload is truly unmanageable, communicate the challenges with someone that can help you set more realistic expectations for your day. Apply these tips to a less stressful work environment, where overwhelming feelings from work will be a thing of the past, and work will definitely be a lot more pleasurable of a place to be.